Buildings with large or steep roofs will benefit greatly from the installation of deep flow gutters. The high flow rate and deep capacity enable the amount of downpipes to be kept to a minimum. First introduced by Marley in the 1970's, other manufacturers soon followed suit. 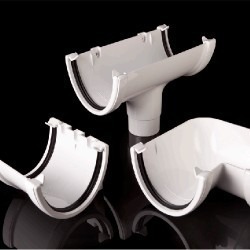 Our own FloPlast Deepflow guttering is now the first choice for many architects and specifiers. This system is manufactured in the UK and is covered by a 20 year performance and 10 year colour* guarantee. 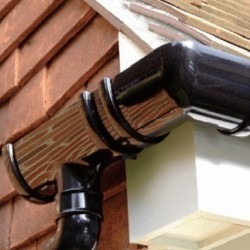 We also stock Deepflow in Cast Iron Effect for a more traditional look that still maintains all the benefits of plastic guttering in high capacity deepflow. Please take a look at this short video which highlights the differences between Deepflow and Standard Half Round Gutters. 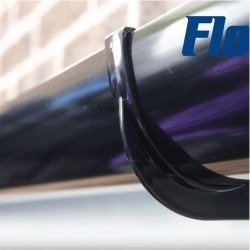 Floplast Deep Flow Gutter capacity varies between 2.05 litres per second (fixed level with the outlet at one end) and 5 litres per second (fixed at 1:350 with a central outlet). This is approximately twice the capacity of our half round guttering system and as such it can cope with the flow from large or particularly steep pitched domestic roofs. If required, the capacity of this system can be increased even further by the use of 80mm downpipes instead of 68mm – however the 68mm Downpipe is perfectly adequate to be used with deepflow guttering - please contact us if you require further details. With this system we recommend that fascia brackets are installed at maximum 1.0m intervals when using standard 68mm downpipes. For tips on gutter installation, visit the Deepflow Gutters Installation Instructions section or the Guides and Tips section where you will find videos, PDF Guides and other useful technical documentation.